Metal garage doors develop dark red or brown stains, which are the result of oxidation. This occurs when the doors get wet and the liquid dries on the metal. The longer you leave the problem untreated, the greater the risk is that the rust will eat through the metal, leaving behind holes. Restoring oxidized garage doors involves cleaning away the existing rust and protecting it from future damage. Metal garage doors oxidize, which causes rust. Pour the distilled white vinegar into a spray bottle. Aim the spray bottle at the garage door and apply a liberal coating onto the metal, making sure you reach all areas of the metal. Rub the dull side of the aluminum foil against the garage door, rubbing off as much rust as possible. Dip a piece of steel wool in the distilled white vinegar to coat the steel wool and give it some lubrication. Rub the steel wool against any oxidized areas of the metal. Apply enough pressure so that the steel wool acts like sandpaper and slowly sloughs off the rust. Apply an even coat of metal primer to the garage door, using a paint roller for a smooth and even coating. 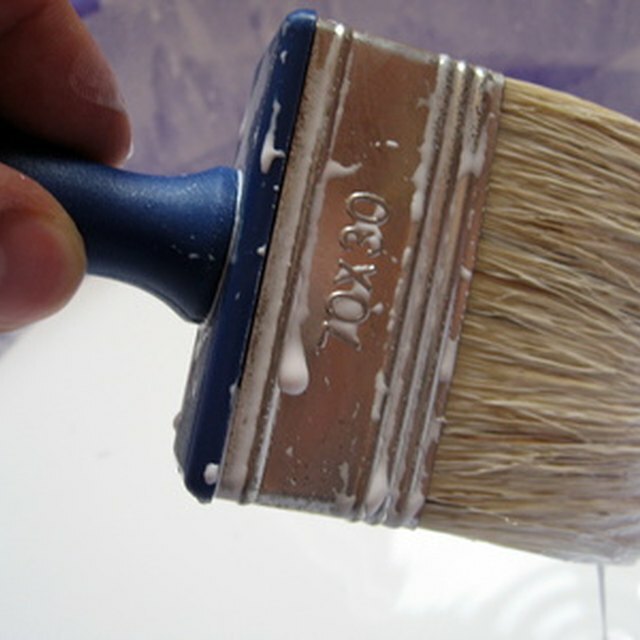 While the primer is still wet, go back over the door with a paintbrush dipped in the primer. Use the paintbrush to reach corners and any spots the roller missed. Cover the metal primer with a coating of metal paint, choosing a color that you like. Follow the same procedure as you did with the primer, applying one coat with the roller and going back over the door with a paintbrush. Apply a second coat if you like and let the paint fully dry. Rub a thin layer of liquid or spray lubricant over the door, such as WD-40 with your hands. Buff the doors lightly with a dry cloth, being careful not to wipe off the lubricant. The liquid lubricant creates a barrier over the metal and prevents future rusting. If the garage doors have any liquid on them, including rainwater, wipe the doors down with a dry cloth before cleaning.